These negative results can hopefully provide important information for others working with the Differentiable Neural Computer (DNC). In this post I’ll cover a series of experiments I performed to test what is going on in the external memory of a DNC, without being able to find anything positively conclusive. This was a followup exercise to my work on Probabilistic Model-Based Reinforcement Learning Using The Differentiable Neural Computer. The DNC is a form of a memory augmented Neural Network that has shown promise on solving complex tasks that are difficult for traditional Neural Networks. When a Recurrent Neural Network (RNN) such as Long Short Term Memory (LSTM) is used in the DNC architecture, it has the capacity to solve and generalize well on tasks with long temporal dependencies across a sequences. At each timestep in a sequence, the DNC receives an external input, and memory data read from its internal read head mechanism from the previous timestep, to manipulate its internal state and produce the next output. The external memory of the DNC also presents an additional mechanism to observe what the DNC is doing at each timestep. DeepMind did some evaluation of the memory contents in their original paper on Neural Turing Machines on some very structured problems it was trained on (such as copying), to infer it was learning algorithms as the memory contents recorded and moved information in structured ways. In my previous work, I used DNCs for model-based Reinforcement Learning, where a model of video games was learned in the DNC. Features from this model were then used to train a controller to maximize its cumulative rewards in the video game. The features fed to the controller from the model were the hidden state and cell state , of the LSTM in the model, at every timestep , as done in the World Models framework. I conjectured that the memory of the DNC used to train a model of the environment could contain useful information that could augment the the hidden and cell states of the LSTM being fed to a controller. 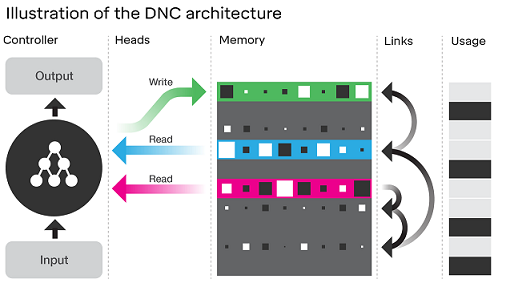 At each timestep, the DNC contains the contents of its full memory ( ), portions of which are read by the read heads ( ) and used to produce the next output. Perhaps or contain useful information for the controller, especially if the video game contains very long term dependencies that need to be tracked as the game progresses. I decided to test what information is contained in the DNC’s memory at each timestep, when a predictive model of the environment is trained using a DNC as in the World Models framework. A “Model” in World Models is trained using Teacher Forcing, where the state of the game, z, at each timestep, along with an action, a, to be performed at that state, is given as input to the model. The model uses this information to predicts the next state. The state in this case is a compressed, “latent”, representation of the frame (image expressed as pixels) from the game at each timestep, created using a Convolutional Variational Autoencoder (CVAE). More specifically, the model receives input and produces output . As I found with my work on Probabilistic Model-Based Reinforcement Learning Using The Differentiable Neural Computer, DNC based models trained this way were able to outperform their vanilla LSTM (without external memory agumentation) counterparts. But, what is going on in the DNC’s external memory when it is trained this way? And furthermore, can this information be useful to a Reinforcement Learning or Evolution Strategies controller? One way to test would be to check if the memory contained, linearly separable information about the current state. But to do so would require some discrete state labels of the video game for which a model was being learned, that could be used as ground truths. These states are not easily available or obvious when a model of the game is being learned from frames (images expressed as pixels) from live gameplay. Thus, with the help of a colleague, I formulated a toy task using DeepMind’s dSprites dataset. 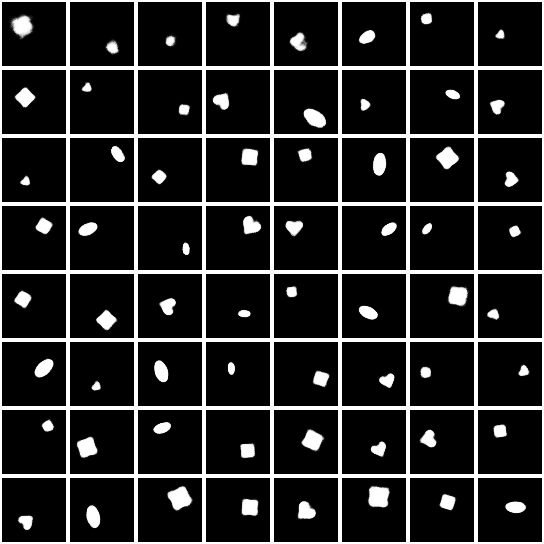 Examples of randomly selected “sprites” from the dSprites dataset. To train a predictive model using dSprites, I created rollouts to mimic what a video game would do. A rollout starts with a randomly selected sprite, and the “action” at each timestep provides information about the next sprite, also randomly selected (since this is not a real game). The actions correspond to the classes of the sprites, but more specifically, are the difference between the classes of the sprites from previous timesteps. If the classes of the sprites are represented at each timestep as , and the actual action provided to the model is represented as , then , where . As with the World Models teacher forcing training to learn a predictive model of the game, the state (the image of the current sprite) and action (classes delta to achieve the next sprite) are concatenated and input together to the model to predict (as output) the image of the next sprite. This setup allows the model to couple the state (the image of the sprite) with the action together to learn what the next sprite should be, rather than depending solely on the action if the action directly provided the classes of the next sprite, as that signal would be too strong and potentially cause the network to ignore the state input altogether. As an example of the action inputs at each timestep, take our first randomly selected sprite to be = [shape=1, scale=0.6, orientation=3.14, position_x=0.0625, position_y=0.0625]. The first input provided to the model would be the image of this sprite concatenated with action = [shape=0, scale=0, orientation=0, position_x=0, position_y=0] (by definition). Then, if the classes for the next randomly selected sprite are = [shape=1, scale=0.7, orientation=0, position_x=0.125, position_y=0.125], the next action would be = [shape=0, scale=0.1, orientation=-3.14, position_x=0.0625, position_y=0.0625]. And so on. Using this setup, rollouts of random length between 500 to 1000 were used to train the model, for 10,000 rollouts per epoch, for 5 epochs. Note that no CVAE or Mixture Density Network was used as is done in the World Models framework. This was to allow the model to be entirely deterministic, to make testing of memory more consistent. After training the DNC models, tests on the content of the memory were performed as follow. For each test, the model was run through 10,000 rollouts as described above, for a fixed sequence of length 500, and the contents of the full memory (in the case of Model B only) and contents of the read heads (both models), were logged at each timestep. Additionally, the full class label ground truths of the randomly selected sprites were logged at each timestep. This test was designed to check whether the logged full memory or read heads of the models contained information that could be used to infer the classes of the sprite at each timestep. As mentioned earlier, at each timestep, provided to the model as input are the current “state” which is the image of the current sprite, and the “action” which is the delta of the current sprite’s class label from the next randomly selected sprite’s class label, to allow the model to learn to use the two combined to predict the next state (the image of the next randomly selected sprite). The test included checking whether at the current timestep, the memory contents could be used to infer the class labels of the current sprite being input. And whether it could be used to infer the class labels of past sprites it had already seen — 5 timesteps ago and 10 timesteps ago. Thus, each test was to check if the memory contained information about the class labels of the sprites presented at timesteps a) t-0, b) t-5, and c) t-10. To do so, a simple single layer feedfroward neural network, without any activations, was used to train to use the memory contents (either full memory or just the read heads) at each timestep as input, to predict the class labels of the sprites at past timesteps as output. The point of doing it this way was to check whether the information being sought (the class labels) was clearly present in the memory by being linearly separable. It is inspired by the -VAE paper. The neural network was trained using Softmax Cross Entropy loss for the shape class, and the Mean Squared Error loss on the scale, orientation, X position, and Y position classes. It was trained for a single epoch on the 10,000 rollouts with the logged memory contents at each timestep of the rollout sequence as inputs and class labels at each timestep of the rollout sequence as outputs. The Adam optimizer was used, with a minibatch size of 256. The inputs (the memory contents) were normalized by subtracting the mean and dividing by the standard deviation at each timestep. After training, as this was a simple linear separability test to determine if the class labels could be easily inferred from the data, the same train set was used to test and compare the predicted classes with the ground truth classes using classification error for the shape label, and Mean Squared Error for the scale, orientation, X position, and Y position labels. The second test was designed to check whether if a pattern of “actions” (sprite classes) were given to the model in a predetermined sequence of length T (no longer of random length), if this pattern could be seen in the DNC’s external memory when logged and analyzed, using Mutual Information. The test involved running the model through a sequence of X positions, and this sequence was then checked using the mutual information score against each memory location by iterating over all memory locations and using the contents at that specific location over the timesteps. For example, Model B had a full memory size of 256, which meant that each location in memory from 0 to 255 had some content, for every timestep from 0 to T of the input sequence the model was provided. If the X positions were fixed to be [0, 15, 30, 15, 0] (T=5), then first, memory location 0’s contents over the 5 timesteps, [?, ?, ?, ?, ? ], were checked against the fixed X position sequence using mutual information score. Then memory location 1’s contents over the timesteps. And so on. The point of this test was to check if the DNC had learned class representations of dSprites and was using the memory to track discrete information about the sprite’s classes — in this case, the X position of the sprites. Both DNC models were able to learn to predict the next state, i.e. the image of the next sprite, fairly well, based on visual inspection. Below, the real sprites are to the left, and predicted sprites to the right, from Model A. Note that the models are trained to output the full image of the sprite directly. Additionally, Model A was tested using the simple linear model trained on Model A’s read head contents at each timestep but instead using class labels from t-5 time steps ago and t-10 timesteps ago, to check if the memory contained information about past classes. Similarly, Model B was tested using the simple linear model trained on Model B’s full memory contents at each timestep. In both cases, the results were significantly worse than those listed above (i.e. predicting class labels at timestep t-0), and were close to the results from the random inputs, hence have been omitted from this post for brevity. Additionally, during each of the 50 tests, a random sequence of class label inputs was created that was of the same length as the ground truth test sequence. This random sequence also ranged randomly between the 32 possible X position class values. The memory content at each location was also tested against this entirely random sequence, as a control. For all sequences tested, contents at each location in the full memory were compared with the true test sequence for X position and the random control sequence. The mutual information score was roughly the same for both sequences, and less than 1e-8, for every memory location, thus showing virtually no mutual information in the memory contents. The purpose of these experiments was to check when training a DNC to learn a predictive model of an environment such as a video game, whether the DNC’s external memory contained information about the states in the environment. 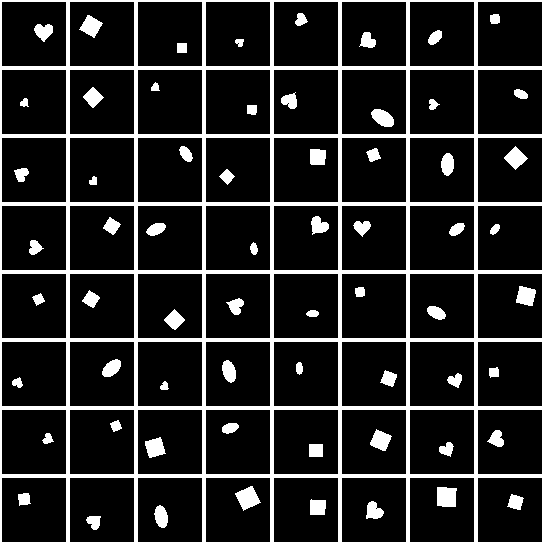 The dSprites dataset was used to create a toy environment, as the sprites have class labels that can be used to map to discrete states the environment is in. Test 1 was designed to check whether the full memory contents together, or the read head contents together, contained linearly separable information about the sprite classes being input at each timestep. However, in all experiments performed, the contents of the memory provided only very marginally better information in predicting the classes than when using random inputs instead of the memory contents. Model A’s read head contents performed slightly better than the random inputs compared to Model B’s full memory contents, particularly on the position classes. This points to a conjecture that perhaps the read head contents when training a DNC predictive model with a larger memory matrix can provide some useful information about the state of an environment. However, strong results should have seen significant improvement (lower errors, closer to zero) over predicting the states when using the memory contents compared to random inputs. Test 2 was designed to check whether the DNC had learned some representation of the classes of dSprites when training a predictive model, and was using individual locations in the memory to track information about the states (classes) of the sprites being input. The tests showed that the DNC was not tracking the class that was tested, the X position, in any deterministic location in its memory, when using a mutual information score. In all tests, the score was close to zero, and no better than a random control sequence additionally tested at each memory location. In future work, experiments could be performed to check whether the memory contains information about each individual classes in isolation. Also, perhaps the predictive model of the environment can be trained in a different manner such as with an augmented loss function, to bias the DNC in exposing more information about the state in its memory. Lastly, the Pygame Learning Environment has games where a discrete encoded state representation of the game can be queried at each timestep, and perhaps the DNC’s memory can similarly be tested on these environments as this representation gives labels for the states.